The effectiveness of a control surface is proportional to the square of the speed – i. e. if the vessel speed is halved, then forces generated by the control surface are reduced by a factor of four. It was apparent that at White Rabbit’s lower operating speed the twin foil plus trim tab system as used on Triumphant would be less effective. A better solution would be to delete the trim tab and add an additional set of foils. Having four foils in a fore and aft arrangement would not only double the control surface area for motion control at sea, but would also significantly increase the added mass and hence the roll resistances of the vessel at zero speed. Numerical modeling predicted that a four-foil arrangement would reduce vertical accelerations in the forward lounge by up to 42% when compared to the 2-foil plus trim tab system. In the twin-foil (plus trim tab) arrangement, the foils provided roll damping, with the trim tab providing pitch control. With a four-foil arrangement, the foils can either be used in unison to provide the calculated best overall ride performance, or alternatively, cam be biased toward reduction of either the rolling or pitching motion. The 4-foil RCS on White Rabbit was developed in close coordination between NWBS and VT Maritime Dynamics (VTMD) starting formally in late 2002. Computer simulations were used on a number of different equipment arrangements in order to determine which was most effective in reducing vessel motions. 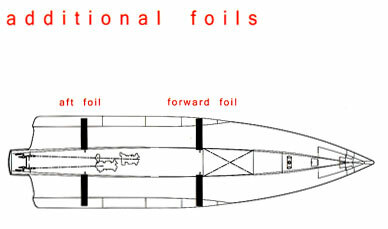 During this process it became clear that the 4-foil design would offer excellent performance when coupled with White Rabbit’s unique trimaran bull shape. Each of the four foils span the gap between centre hull and one side hull. The locations and orientation of the foils have been optimized to produce maximum motion control. White Rabbit has an interesting foil pivoting arrangement that results in a robust yet simple design. In the centre hull the foils pivot in a large 300mm diameter spherical ball. At the outer hulls the foils are attached to struts that extend down through the bottom of the ship. The system has few moving parts and most of these are accessible above the waterline for servicing or inspection. High quality aluminium and stainless steel materials are used throughout the foil system. The leading and trailing edges of the foils are made of extruded aluminium using a specialized process. These extruded foil shaped sections a specialized process. These extruded foil shaped sections reduce weight, improve surface quality, and are readily repaired or replaced. The Ride Control System on White Rabbit is unique and will provide excellent performance and reliable service well into the future. VTMD is very proud to have been part of the team that produced White Rabbit. The effectiveness of the four-foil system was proven on sea trials. 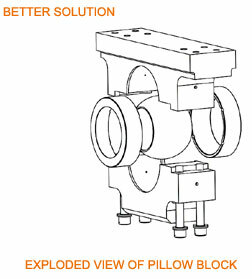 At all headings, roll and pitch motions were significantly reduced. 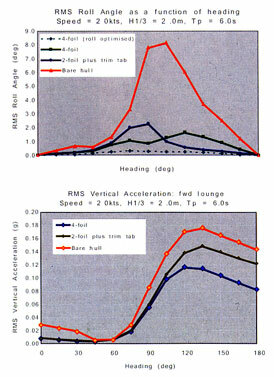 At speeds of 18 and 19 knots the reductions in roll are up to 75% and in pitch are up to 55%. At 12 knots there are reductions in roll of up to 60% and in pitch up to 32%.